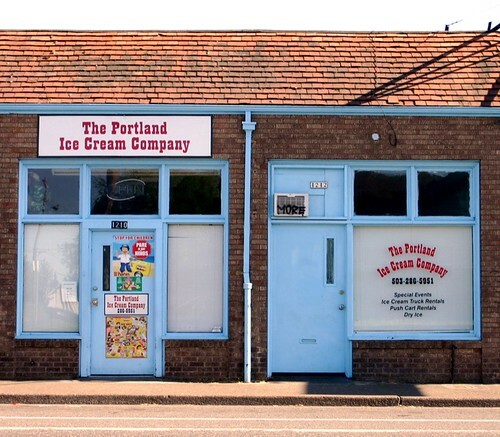 Continuing on the theme of signs of North Portland, here's the fabulous classic front of The Portland Ice Cream Company. The ice cream vans playing those irritating jingles through your neighborhood most likely fill up here, as I've seen them parked out front. Why the air conditioner unit is tagged "more" is beyond me. 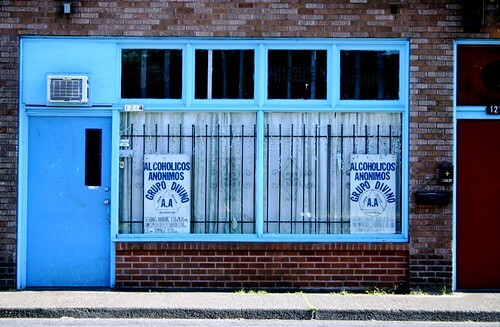 And when you're done with your ice cream, you can go next door to Alcoholics Anonymous for a little 12-step. In espanol. Ice Cream and spanish AA is a VERY odd combo! I have been wondering where to find an espanol AA meeting. If I couldn't have a bourbon on the rocks, then I guess I'd be happy with an ice cream? They need to trade spaces so the 12 steppers can have the 1212 address. Much easier to remember after backsliding. I bet they don't sell Butter Rum ice cream.